Cancer patients need wigs after losing clumps of hair during medication. It is normal for someone to feel upset when they lose their hair during chemotherapy. This is because drugs damage hair follicles leaving the patient un-expectedly without hair. We have an excellent solution for you, no reason to be anxious or worry anymore! A suitable cap is important to cover the thinning hair; this restores your ego in public and gives you the comfortable feeling of natural hair. For a woman suffering from cancer that possibly leads to thinning in the process of treatment, Full Lace wigs or Full Cranial Prosthesis are your latest and classy hair replacement components. Any woman seeking satisfaction after a discouraging loss of hair will find self-pleasure in Full Lace Wigs or Lace Front Wigs. Full Cranial Prosthesis aka Full Lace Wigs or Lace Front Wigs gives women suffering from cancer a beautiful auxiliary for their hair loss. This hair restores their joy since it has a strong resemblance to natural hair and can be styled in any way, parted anywhere just like one will do to their natural hair. Full Lace wigs come in several lengths, colors and textures and can therefore be worn in high ponytail, braided in cornrows and styled into any style of luxury. It is difficult to notice this hair; it is secured on the head’s skin using a skin liquid adhesive or tape creating an unseen hairline which gives a true appearance of naturally growing hair. 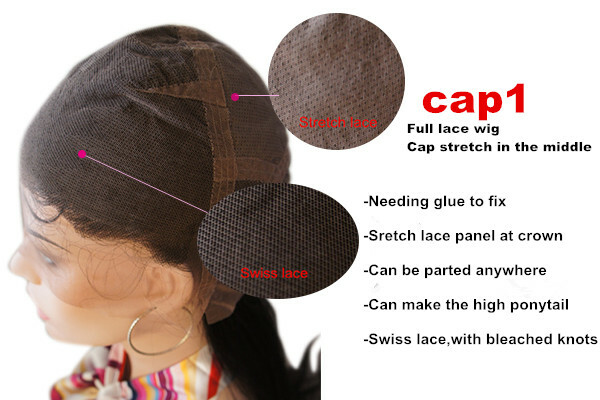 One strand is tied at a time to the lace base; this makes it difficult to detach, its gauze-like lace fabric that makes up the cap is made pure in order to take the skin color of the natural scalp. It is also build uniquely to allow excellent aeration and eradicate discomfort from heat or dampness. Full Cranial Prosthesis aka Full Lace Wigs or Lace Front Wigs are 100% remy human hair. In addition they are light in weight and appear natural and unnoticeable by close keen viewers. One feels extra-ordinary comfortable with options to curl the hair, blown-dry, perm, color or style in a more elegant way. The hair seems as if growing from their scalp. 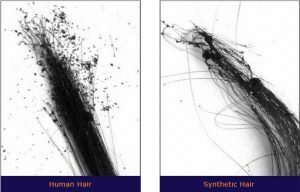 Choosing between synthetic hair and human hair can sometimes be a headache. The truth is that both are not the same and so one is superior to the other. The question is, which one will best serve your needs? Whereas Synthetic hair is highly destroyed by heat, meaning that one cannot blow dry, curl or attempt to straighten these wigs. Synthetic hair extensions and sections cannot be dyed or color treated; human hair wigs allow you to style as much as you wish to. While synthetic hair can only go up to three to six months with great care, well maintained human hair wigs gives you’re a service of a whole year or twelve months. Synthetic hair wigs appear like human hair from far but when closely viewed one will notice the difference centrally to human hair wigs which have look truly natural and feel like natural hair even at cross range. Human hair wigs requires great care in order to serve you best and offer great comfort whereas synthetic hair wigs need less maintenance and rarely lose their original style. Just like natural hair, human hair wigs need to be styled frequently to maintain the good looks contrary to synthetic hair wigs that can be worn right from the box. In addition, synthetic hair is quite cheap to acquire while human hair wigs are expensive to acquire. Human hair wigs is really superior, elegant and sophisticated. It has a versatile ability to style into any modern appearance. This coupled with a natural look makes human hair wigs only comparable to real natural human hair. Research has it that at the same density synthetic hair wigs are heavier than human hair wigs. Human hair wigs are specially designed to allow aeration of heat and moisture unlike Synthetic hair wigs cannot respire therefore the scalp may sweat and itch more than normal. The fact that human hair wigs can be dyed, streaked or treated with shampoo just like natural hair makes maintenance of this hair a friendly and enjoyable undertaking contrary to synthetic hair wigs which require specialized treat once in a while. Human hair burns briefly and will not continue to burn unless you hold it to the fire. The brief flame is orange, then the hair chars leaving a dark ash that turns to powder when crushed. The odor smells of burning flesh or burning feathers. Synthetic hair ispolyester fibers.burns and melts quite rapidly in the same instance. The sputtery flame is orange and with black smoke. It melts, drips, then becomes sticky to the touch before forming an ash of hard black beads. So why would one prefer a heavy load that does not give you the comfort of life up on your head? You need human hair wigs for that feel of a unique lady and true restoration of your natural hair. Human hair wigs will remain a great choice for a cancer patient who wants to keep the flexibility of natural hair and easily go for any fashionable style of choice. This will give a feeling of self- confidence and acceptance defying any feeling of abnormality since human hair wigs appear naturally growing from the scalp. Above all, they are longer lasting wigs, if well maintained they serve you more than a year. Human hair wigs for cancer patient are the top best wigs that give a natural feel. You need to get these wigs because they are the best to keep your beauty, flair and classy hair panache.